December, time has come to recap! first name @ name of your blog (A1/B1/C1/D1/E1: Bingo), or whatever Bingo you did! I will choose 1 winner among the readers who made it. BINGOS may be claimed by completing 5 spaces in a row–horizontally, vertically, or diagonally. You may also claim a “Four Corner” BINGO by reading a book for each of the four corners plus 1 more space —any space you wish. you get 1 extra entry per 1 extra square you fill in – these extra squares can be located anywhere on the board. So after your bingo, the more squares you cover, the more chances you have to win a book at the end of the year! for the squares where it says “by a French author” (A4 and A5 for instance) it’s ok to read the books in your native language. You can contact me if you have any question or if you are looking for titles. You can find great ideas here: Here are the titles I have read for 2015, and Here is my French list for 2014 Here is my list for 2013. Books read by bloggers who did the French challenge in 2014 You can find also great titles on France Book Tours – all the books there fit this challenge! If you are a Goodreads member, you can access my France shelf. I will also add a recap at the end of each month for more ideas of titles! So be sure to follow this blog through Blgolovin’ or email so that you don’t miss an update! There’s also now a Goodreads page for our Challenge! THERE WILL BE A GIVEAWAY AT THE END OF 2015: BE SURE TO FINISH YOUR CHALLENGE TO GET A CHANCE TO WIN 1 BOOK! 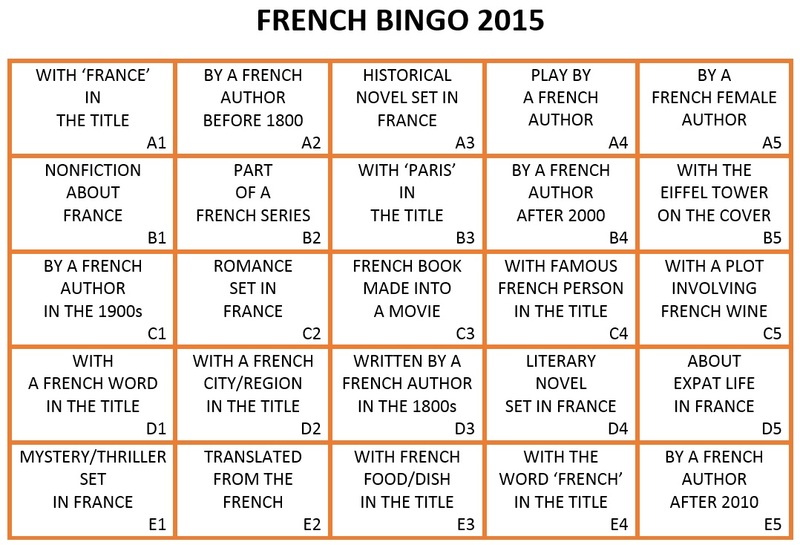 This entry was posted in foreign, France Book Tours, French Bingo, I Love France, Reading Challenges and tagged Bingo, France, France Book Tours, French, French literature, Reading Challenges by WordsAndPeace. Bookmark the permalink. come join us, it should be fun! I’m looking forward to starting this …..at last something to make me less lazy about reading in French !!! awesome! Of course, you can read all the books for the BIngo in your native language. Thanks for your comment, it made me realize this point was not clear enough. I just added a NB. Yes, it’s ok to read all the books for the bingo in your native language, but of course, good for you if you can read some in French! This is a neat challenge. I’m looking forward to it. Emma, Thanks for the clarification. I have no problem with the policy–there’s plenty I want to read that fits. oh good! have you made a post with a tentative list? Emma, I understand your reasoning about what constitutes a French vs. a Francophone author. However, I’m not sure why all the books on the France Book Tours “fit this challenge” since many of those authors aren’t French either. Is the “French” criterion only mandatory for those specific bingo fields (i.e. “Play by a French Author”) and not the general ones like “Mystery/Thriller Set in France”? Help! you are right, not all books on FBT would fit the challenge, but lots. Correct: “mystery set in France” can be written in any language, by author of any nationality, also books with word France in the title, etc. But if you want to make more difficult for you, feel free to narrow the rule to “written by a French author” for all of them! Thanks for your replies! Have decided to jouer au bingo with you, probably under the “more difficult” option you suggested above, and will link to a signup post & reviews before the end of the month. Bon week-end! looking forward to see what you read for this challenge! I’m certainly looking forward to reading more French books this year. It will be interesting to see how the bingo card works out. It gives it a new twist- thanks for keeping things exciting Emma. I’m game. I don’t have a blog. I’ll be using my Goodreads account under the name Kimberly V.
welcome Veronica, enjoy the game! this is going to be fun. I already have taken out the first book from the library. awesome, which book is it? I am curious! You could also say it’s fiction that is neither mystery nor romance, nor historical, where the focus is more on the writing style than on the plot. Proust for instance is clearly literary fiction. merci, you were planning it for D5, right? oh thanks! I know of several bingo reading challenges, but didn’t know about this one. really good: if someone wants something Canadian, and not just French, I’ll know where to send them! And that gives me the idea to Create a Goodreads group for this challenge!! merci! excellent! you seem to really be taking this challenge seriously, lol. good for you! wonderful! I’m glad row D is working for you, lol. Curious to see how you will feel in the last 3 squares! I haven’t done a sign up post yet- I’ll try and do one soon. excellent! At the end of the month, I will recap what has been listed so far. Getting really exciting! Not sure which square this will finally fill, but I wanted to get it in. An intriguing book by an impressive author. If this one sounds too weird, try All My Friends, her short story collection. I’ll check into the captcha thing–there isn’t supposed to be one. thanks for letting me know. I got rid of it.. Thanks for the comment. I’m sorry you had such a problem. I’m glad you told me about it. And I got to doing an introductory French Bingo post. I wish. No my French is too rusty, but I’m working on it. excellent, wow readers are really on a roll here! I really want to read the book by Ferrari, so on my way to see what you have to say. Emma, here’s my sign-up post at last. Thanks again for the invitation. no problem, with all my crazy changes on this, it was definitely confusing! You have the great playwrights: Racine, Corneille, Molière. In theater you also have Beaumarchais, Lighter but funny. Plus of course Voltaire, Diderot, Rousseau, even The Marquis de Sade!! He wrote some stuff before 1800. 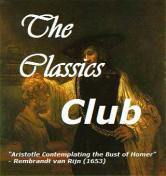 See here for some ideas: http://en.wikipedia.org/wiki/18th-century_French_literature. And there are some other interesting authors earlier than that as well! They are authors I am ashamed to say I have never read. Still they are not going to go away are they?? awesome. please link your reviews with the mr linky widget after each review you post, and specify what square it should go in. here is the direct link, look at the previous ones to use the same format: http://www.blenza.com/linkies/links.php?owner=wordsandpeace&postid=28Jan2015&meme=12282. otherwise you can find the Mr Linky widget on the Bingo page: https://wordsandpeace.com/2014/12/01/french-bingo-2015-reading-challenge/. it is not enough to rate a book on Goodreads, you have to write at least a few lines about it. Posted a review for Paris in July, and having just discovered your French Bingo Challenge thought I would join in. Hope that’s OK.
Book Number Two posted… Two down, 23 to go. This is fun! wonderful! keep it up, have fun above all! wow, awesome! When you look at the links by others, #13 read Cousin Pons (https://en.wikipedia.org/wiki/Le_Cousin_Pons) for author before 1800. The author is Balzac (1799-1850): https://en.wikipedia.org/wiki/Honor%C3%A9_de_Balzac. He wrote a multi-volume collection of interconnected novels (with recurring characters) reflecting life conditions in his time: https://en.wikipedia.org/wiki/La_Com%C3%A9die_humaineo. Bonjour Emma! Just added a link for Albert Camus’ L’étranger. Should be back for regular Bingo posting again soon! Bonjour! Nathalie Sarraute’s Le planétarium has been added. Another great read. Salut Emma, ça va? J’ai écrit un billet sur le roman policier de Jean-Claude Izzo, Total Khéops. merci Richard, excellent! J’ai 3 livres de lui que je n’ai pas encore lus! Hi Emma, just added a mixed review of a Fred Vargas novel. Only need a D2 for my Bingo now! Thanks Richard. left a long comment on your post. Good luck for D2. Anything in mind? Hi Emma and thanks for that “long comment”! For D2, I’ll likely be reading Zoe Oldenbourg’s Le bûcher de Montségur: 16 mars 1244 about the crusade against the Cathars. I’ve wanted to read this book for ages, but it was only recently that I saw for myself that it’s a history book and not a historical fiction book. It’s pretty good early on so far. I finally scored my unofficial Bingo, Emma, “unofficial” because an end of the year health scare will keep me from writing up a review of Proust’s The Guermantes Way (D2) for my diagonal A5 to E1 bingo. Still, it was fun playing. Thanks for hosting and Bonne Année! Bonne année Emma, et merci pour un défi très amusante !